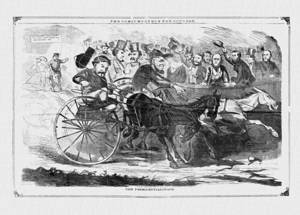 This cartoon from The Comic Monthly applies a common horserace theme to the presidential election of 1864. Incumbent Republican Abraham Lincoln has the inside track as his galloping white horse pulls the “Baltimore Platform” (approved at the Republican National Convention) toward victory. The agitated Democratic nominee, General George B. McClellan, is having difficulty because his two black horses are working at cross-purposes: the “War Democracy” strides forward, while the “Peace Democracy” halts abruptly. McClellan supported the Union war effort, but criticized Lincoln’s management of it. At the Democratic National Convention in Chicago, however, Peace Democrats passed a plank endorsing a ceasefire and negotiated settlement. McClellan repudiated the peace plank, but the contradictory views of the Democratic Party remained a political problem for the candidate.